Are you planning to go Everest Base by Helicopter ride and want to know about the best time to go? If yes, then this article will clearly answer your questions regarding the best time for Everest helicopter tour in Nepal. Mount Everest (8848m) is the highest mountain on the earth. It lies on the border of Nepal and China (Tibet) border in Nepal. The famous mountain peak is the highest place on the globe. So to see the Mount Everest, climb over it and experience the Himalayas, many people come to see in Nepal. They plan to visit the famous mountain region. There are different way to visit the famous Everest Base Camp from Kathmandu. Flying to Lukla and trekking to the BC is the most popular way to reach at the altitude of 5545 meters at Kalapathar to enjoy the panoramic views of Mt Everest and other several peaks. It takes about 10-14 days to complete the trek from Kathmandu. Another way to reach the Everest Base Camp in 3 hours from Kathmandu and return back is flying by helicopter ride. Everest helicopter ride requires 3 to 4 hours from Kathmandu on private and group charter heli flights. In Nepal, spring season falls in the month of March, April and May. This time is best for helicopter flight in the Himalayan region. The days are sunny and clear. So the visibility is very good in spring. The weather is favorable one. Less rain and less windy days are best for the helicopter flight. Spring time of best for heli tour because of the awesome views of Himalayas, colourful landscape and flow of trekkers in the Everest region. To explore the climbing trip of Mount Everest climbers, this time is the ideal one. The autumn season falls under the month of September, October and November. So the weather is cool after the rainy season and less rains. The hills and valleys are green with the monsoon season. The views is superb one. The sky will be clear and days are warm enough. The visibility is clear and good. So helicopter tour in the mount of September, October and November are awesome in autumn. It is the top most favorable season for trekking in Nepal Himalayas. The winter season in Nepal falls in the months of December, January and February. This time is also suitable for helicopter flight. The hills and peaks are fully covered by snow and everywhere in the mountain area is covered by snow. The crystal clear views of Himalayas is awesome. Helicopter on this time is good but the visibility might be not clear all the time. Snowfall might occur so it is better to check the weather forecast for the helicopter flight. If you are planning for the helicopter flight in monsoon season, it is not advisable one. The frequent change on weather will affect the regular flight and it is dangerous to fly in low visibility. Heavy rainfall might disturb the helicopter to fly and land at different places. So helicopter tour in Everest is not suggest in rainy season. However it is possible to operate in this time. Best time for Everest Base Camp Helicopter tour is spring and autumn season. The best time for the Everest helicopter is on the month of March, April, May, September, November and December. Annapurna Base Camp tour by Helicopter from Pokhara is the short way to reach the world’s 10th highest mountain base camp within an hour. This is the alternative way to go Annapurna Base Camp without trekking all the way of ABC trek. The Annapurna Base Camp Helicopter tour is possible on private charter and group joining basis. Private helicopter flight to Annapurna is possible from Kathmandu and Pokhara. However group joining heli tours is only operated from Pokhara in the specific seasons. The helicopter flight starts from early morning by 6 a.m. or 7 a.m (depending upon the season). The flight starts from Pokhara airport towards the north. Once you fly from Pokhara, the helicopter directs to Mount Annapurna during you will enjoy the clear blue sky, beautiful and picturesque Annapurna Sanctuary and then landing at base camp. You can enjoy your breakfast and cup of warm coffee with awesome views of Annapurna Himalayan range 4,130 m high. After the exploration you will return by the same helicopter to Pokhara with your group. The flight distance is about 35 km from Pokhara. How long time helicopter will landing at Base Camp? It’s about 15 to 25 minutes on Annapurna Base Camp. It will be difficult to spend long time at the altitude for long time. So take some photos, videos and a cup of warm coffee. You will revert to Pokhara. The flight cost depends on the group joining basis. A helicopter can accommodate upto 6 persons in a single flight. So the cost is on sharing basis of group size. Normally a group of 6 persons pays US$ 2200 for a flight. So single persons cost is about US$ 400 per person. For the charter flight, you will pay about US$ 2000 to 2500 per flight. Flying over the Himalayas by riding a helicopter is the lifetime memorable event. This article describes the top 5 helicopter tours in Nepal with detail information. Helicopter flight with landing at the base camp of various mountain peaks is the luxurious tour to explore the Himalayas in short period of time. Helicopter tour to Everest Base Camp, Annapurna Base Camp, Langtang Valley, Muktinath temple, Pathivara Temple visit and Damodar Kunda tour are the more frequent helicopter tour in private charter basis. Some helicopter tours are available on group joining basis which allows to share the same helicopter with other people in order to fly in low budget. Everest helicopter riding tour with landing at Kalapthar is the top heli tour in Nepal for mountain views. Mount Everest is the highest peak in the world. Many people have desire to see the Mount Everest on their own just in front. This Everest Helicopter tour offers an oppertunty to explore the beautiful landscapes of mid Nepal, Langtang, Gaurishankar and Everest mountain range. Everest helicopter riding tour strats from Kathmandu airport to the east and lands at Lukla. After fueling the helicopter flies from Lukla towards the Mount Everest and lands at Kalapathar. The flight is very famous for Everest view. Panoramic views from Syangboche and tea/coffee break at Everest view hotel is the another attraction of this tour. The flight can be of maximum 250 kgs load on per flight. 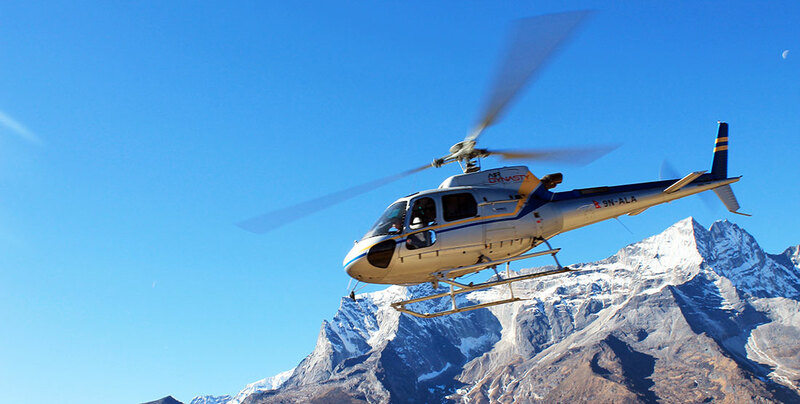 Annapurna Helicopter tour is the second top helicopter tour in Nepal. Annapurna Base Camp Helicopter starts from Kathmandu to the west and lands at base camp of Mount Annapurna (8093m). The helicopter tour is short from Pokhara in compare to Kathmandu. During the helicopter tour, mountain views of Manaslu and Ganesh Himal is awesome. Additionally Annapurna, Dhaulagiri, Fishtail, Nilgiri and other many Himalayan peaks are awesome. The helicopter tour offers close-up views of Himalayan peaks, glaciers, lakes and farming lands. It is worth to fly to explore the Himalayan range. Langtang Helicopter tour is the shortest mountain tour by helicopter ride from Kathmandu. Langtang Mountain ranges to the north of Kathmandu valley with many glaciers is beautiful one. Langtang valley is rich in cultural heritage and offers great views of Himalayas. The Langtang helicopter tour is starts from Kathmandu and flies above the hills and farming lands. Langtang valley helicopter tour is worth to fly with family and friend of maximum 6 hours. Muktinath Helicopter tour is a religious helicopter flight from Kathmandu. Muktinath is the temple dedicated to Lord Bishnu. Muktinath temple Yatra for pilgrims is frequent by helicopter ride. The helicopter is best for mountain views and religious propose. The helicopter tour is best for the Hindu pilgrims and family groups. Maximum of 6 persons in a flight is possible on the helicopter ride. For those who have limited time but want to visit the Muktinath temple, this is the only one option. Another popular helicopter tour in Nepal is Gosainkunda Lake visit by heli ride. This is the frequent helicopter tour from Kathmandu to famous religious holy Lake Gosainkunda. Gosainkunda Lake Helicopter tour is short helicopter ride from Kathmandu valley. It offers awesome mountain views and visit of Gosainkunda Lake. The helicopter tour is for mountain views and religious aspect. Private helicopter tour is the best way to explore the Himalayas and remote destination of Nepal. 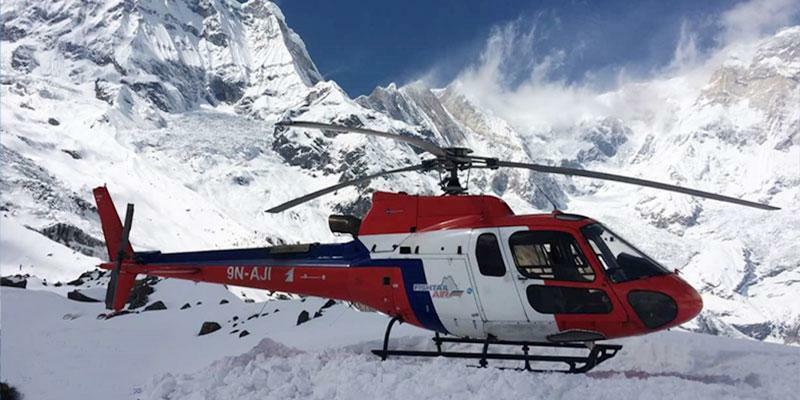 Among the many helicopter tour the top 5 best helicopter tours are Everest Base Camp Helicopter tour, Annapurna Helicopter tour, Langtang helicopter tour, Muktinath Helicopter tour and Gosainkunda Lake helicopter tour. Among the helicopter tour Everest heli tour is the most popular top helicopter tour in Nepal. Everest Helicopter tour cost depends on the helicopter tour type and the time you want to fly to Mount Everest. Private charter tour price is higher than the group joining helicopter tours. The helicopter tour starts from Kathmandu and ends after approx. four hours by returning flight. Similarly, the Helicopter Tour cost to Everest depends on various factors like; your group size, Flight Season and flight duration you want. Besides the monsoon and winter season, normal weather days are suitable for Everest helicopter ride. Everest Base Camp Helicopter Tour is an ideal package for the time bounded peoples who has keen interest of exploring the high Himalayas including the Mount Everest. It is probably the shortest way to reach the base camp of Mt Everest from Kathmandu and returning in same day in comfortable way. In the recent years its popularity is getting at the peak level. This Heli Tour to Everest lets you explore the highest mountain of the world just in few hours. The Heli Tour to Everest offers incredible mountain Panorama along with mesmerizing rolling hills. What Factor Affects Everest Helicopter Flight Cost? Everest Helicopter Tour cost depends on various factors like; your group size, Flight Season, Duration etc. Also the helicopter flight type such as private charter or group joining trip also plays the vital role on helicopter tour price. Private helicopter charter flight cost more than the group joining tour. However the private charter flights also gives the opportunity to ride five persons at a time in a single charter flight. In group joining helicopter tour, the price of the total charter is share with the total number of persons flying together in a group joining tour. Maximum number of five peoples can join Everest Helicopter Tour as one group. As you share the Helicopter your cost will also be shared and you can complete Everest Helicopter Tour in comparatively low cost. Another major factor that determines your cost of Heli tour is travel season. Autumn and spring are the busiest travel season in Nepal; it’s very difficult to get Helicopter during these seasons. So, the cost will also increase as the demand increases. Normally, Everest Helicopter Tour completes in 3 to 4 hours, but if you want to extend the flight hours, your cost of chartered helicopter will increase. We can manage a Helicopter Tour in Charter Helicopter for maximum 6 peoples from Kathmandu to Syangboche. The carrying capacity of Helicopter decreases at high altitude. So when flying to Kalapathar from Syangboche and vice versa, we need two shuttle. Charter Cost depends on your group size; it is US$ 4000 for 3 persons and US$ 4500 for 6 persons. If you join a group you can complete the Heli Tour in US$1400 per person. Group Joining is a good idea to decrease your personal cost of chartered helicopter. Everest helicopter tour price shares with the total persons flying on the same helicopter. The Maximum number of 5 peoples can join in one group. This will divide the total cost into five equal halves. How to Join in a Group Joining Heli Tour? You can check our fixed departure dates and join a group easily. It is not necessary to have your own group for Helicopter Tour; we will help you in find a suitable date for you. You will get a chance to meet and interact with the new friends of different parts of the world. This will make your Tour more exciting. It is better to have flexible dates to join in a helicopter tour. Our Helicopter Tour to Everest Departs only when the minimum group is complete. Normally Everest Base Camp helicopter tour program is scheduled as below timing. However the weather and the air traffic of Kathmandu airport subjected to the vital player of the flight. Please note that time is indicative and may vary. Timing depends on weather conditions and air traffic at Kathmandu and Lukla airport. An experienced English speaking guide to go with you on the trip. Cost covers his/her wages, meals, medical insurance and transportation allowances. Entry fee for Sagarmatha National Park USD 30 per person and a Local Area Permit USD 10 per person. We need your full credentials or a copy of your passport with your weight information. The helicopter tour depends on total weight in helicopter. So, please provide your weight to pre-plan if we need to arrange shuttle trips for proper weight distribution. We need 20 to 30 percent advance of the total package amount to book the helicopter tour confirm. You may pay rest of the amount before the helicopter flight departs from Kathmandu. Send us your requirements and date to book your heli tour.